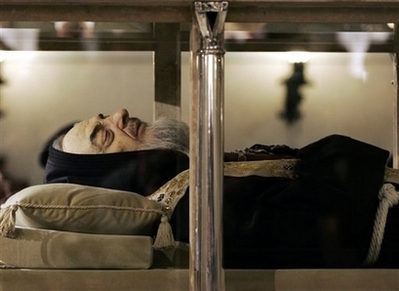 The exhumed body of the mystic saint Padre Pio lies in a glass sepulchre 40 years after his death, in the crypt of Santa Maria delle Grazie in San Giovanni Rotondo, southern Italy April 24, 2008. 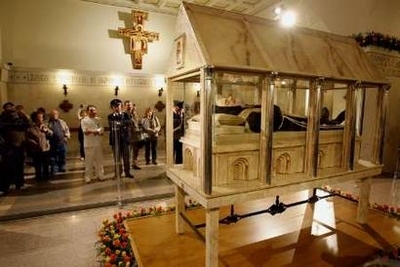 A silicon hand-painted bearded mask of the face of Padre Pio, an Italian saint, is seen on his body laying in repose inside a crystal casket in the crypt of the church of Santa Maria delle Grazie in San Giovanni Rotondo. The body of Padre Pio, a hugely popular Italian saint, was put on public display Thursday, and thousands of people gathered to pray to the mystic monk who many Catholic faithful believe suffered wounds similar to those of Jesus’ crucifixion. 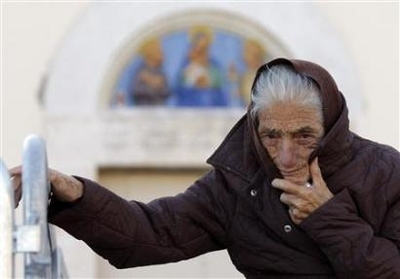 An elderly woman who says she was cured of a fatal disease by Padre Pio walks in front of his Capucchin monastery at the San Giovanni Rotondo village in southern Italy.